Juice half of the oranges. Zest half of the blood oranges. Slice off the orange peel from all remaining oranges and slice the fruit into rounds. In a small pot over medium heat, bring the oats, water, milk, cinnamon, and blood orange zest to a gentle boil. Reduce heat, allow to simmer for 5 min., and keep stirring the porridge until it has reached the desired thickness. Add crème fraîche and stir well. If the porridge is too thick, add a little extra milk. Heat a pan over medium heat, add sugar and let caramelize, then add butter and gently tilt the pan to help it melt. Stir to combine. Once started to bubble, deglaze with orange juice, stirring well. Add orange and blood orange slices to warm them through in the caramel. Remove from heat. 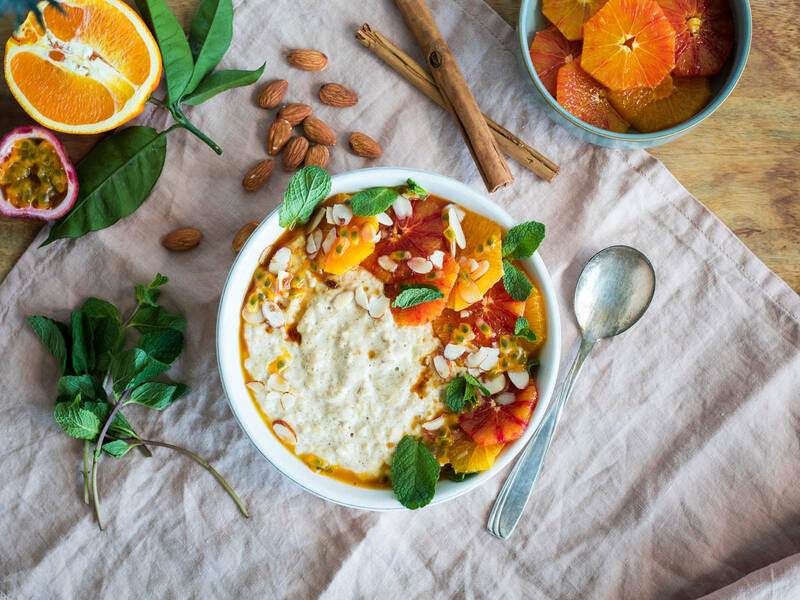 Divide the porridge between serving bowls, and top with orange slices and orange caramel. Halve passionfruit, scoop out the pulp, and divide between the bowls. Dust porridge with brown sugar, sliced almonds, and mint. Garnish with ground cinnamon to taste. Enjoy!